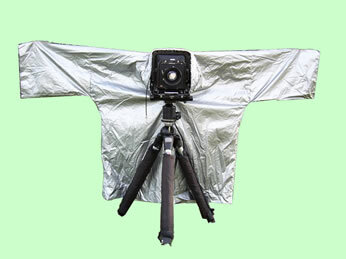 While it is loaded with features, the real magic of the BLACKJACKET™ focusing cloth is the revolutionary use of sleeves, which provide a means to insert one's hands into the darkened environment to access camera controls and/or check focus, and still maintain total darkness. Like a doorless, s-shaped entrance to a production darkroom, the folds in the sleeve fabric trap light that otherwise makes focusing so difficult. Peruse the list of individual features with the navigation menu for more information, or click on the DEMO link for a step-by-step visual tour of how it works.